This recipe originated on the back of a Baker’s chocolate box- and I assure you- if you like a rich, fudgey brownie with a minimal amount of fuss- this is it. Seriously- that’s everything. 8 ounces of unsweetened chocolate- we used the 100% cacao and you will not regret buying it- 5 eggs, 1.5 cups of flour, 2 sticks of butter, and a healthy splash of vanilla. 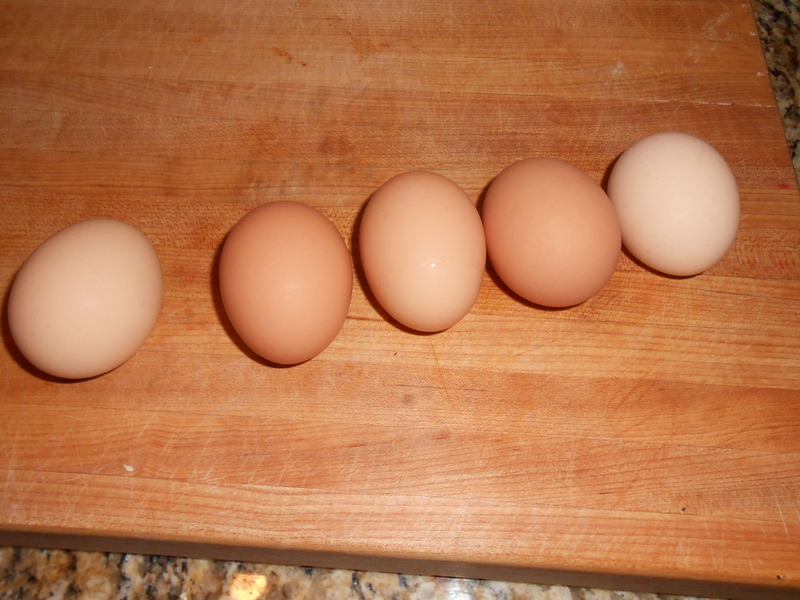 We start with the eggs. 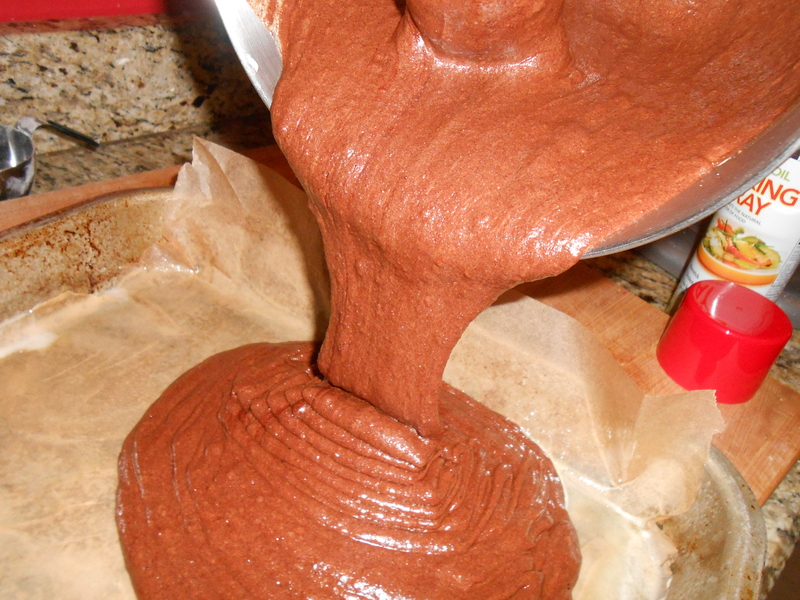 You are going to want to do this in a stand mixer unless you want to be chained to the brownie bowl for a solid 10 minutes. Crack the eggs into the bowl of the mixer, add 3 cups of sugar (yeah… I said 3 cups)- and let it spin over medium-high speed for TEN MINUTES. Not nine… not eight…. not until just combined- a full 10 minutes. You will notice a major change in the texture of the sugar and eggs- it will be thick, and light in color (almost like a pudding)… Eggs and sugar getting started Meanwhile, while you are whipping those eggs and sugar- get the butter melting in a pot. You ought to do this in a double boiler, but I do it in a saucepan and watch it closely. Add the chocolate and melt completely. Stir constantly- do not walk away- your chocolate will burn. If you burn the chocolate you need to start over. Extra step- but makes a difference if you want to get the brownies out perfectly. Spray the pan with non-stick spray, then line it in parchment, and respray. 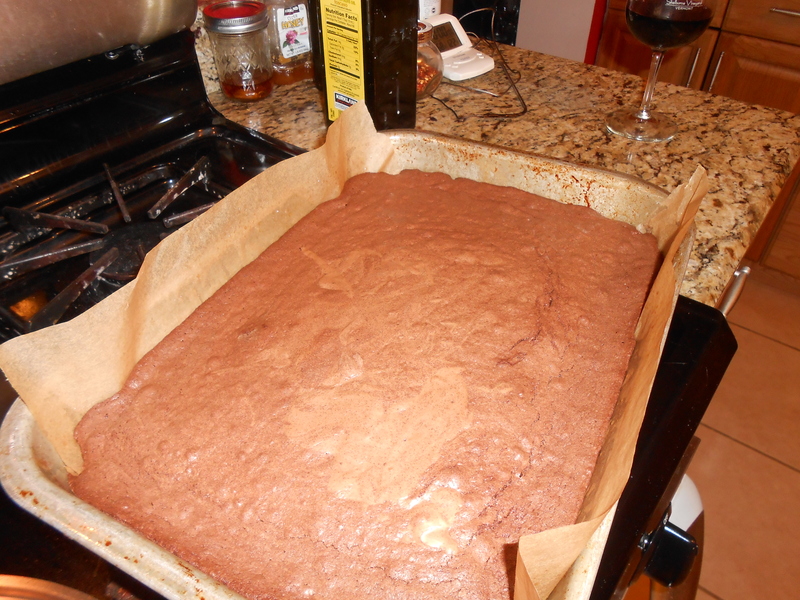 Nothing sticks, and you can lift the entire pan of brownies out at once. 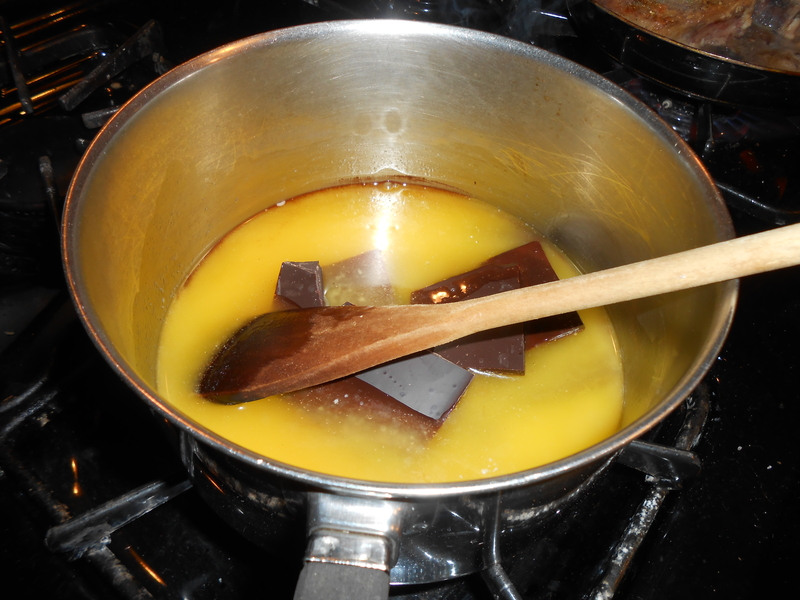 By the time the chocolate is melted with the butter and the pan is lined- your eggs are done! I set a kitchen timer to make sure they whipped for the full 10 minutes Nice and thick Let the chocolate and butter cool a bit- but then pour a small amount into the eggs, and stir it in immediately, “tempering” the eggs. Don’t put really hot chocolate in the eggs- but you don’t need to cool it off entirely, either. 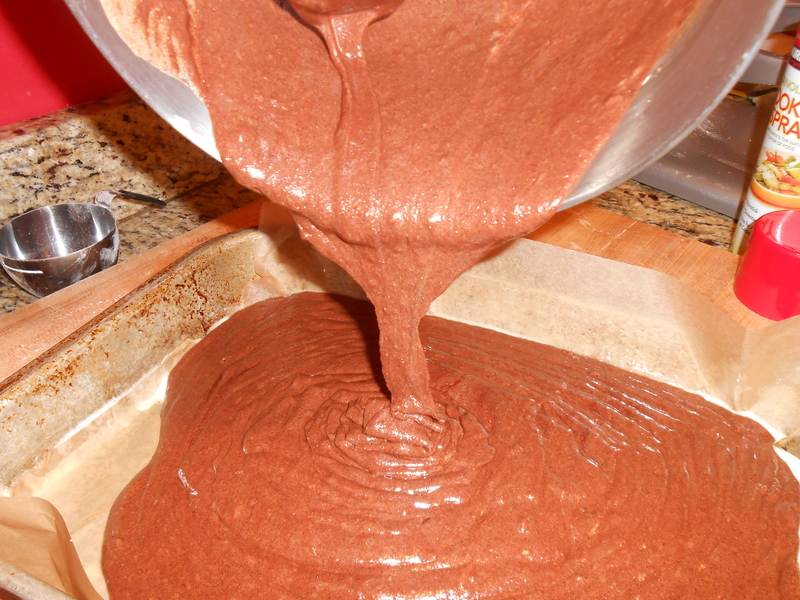 After “tempering”, add the rest of the chocolate. 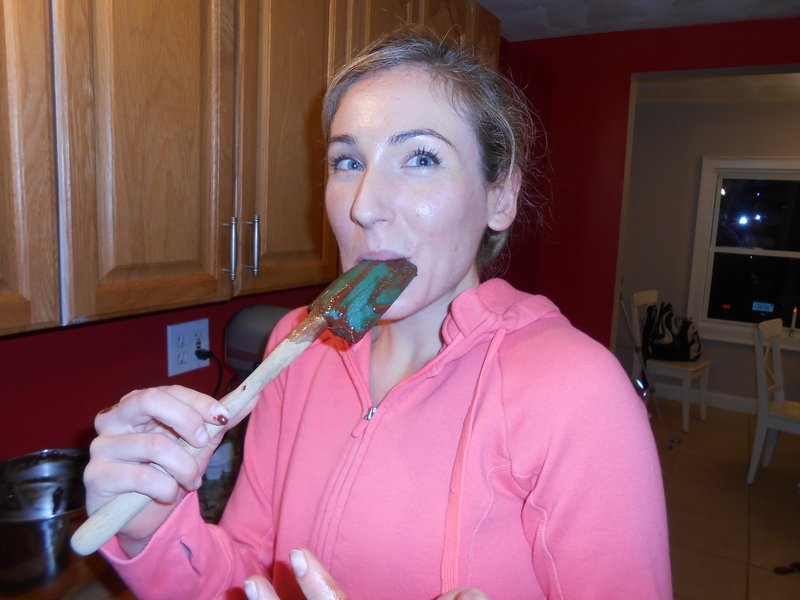 You can use the mixer to do this, but I switched to a spatula. (better feeling for chocolate integration). 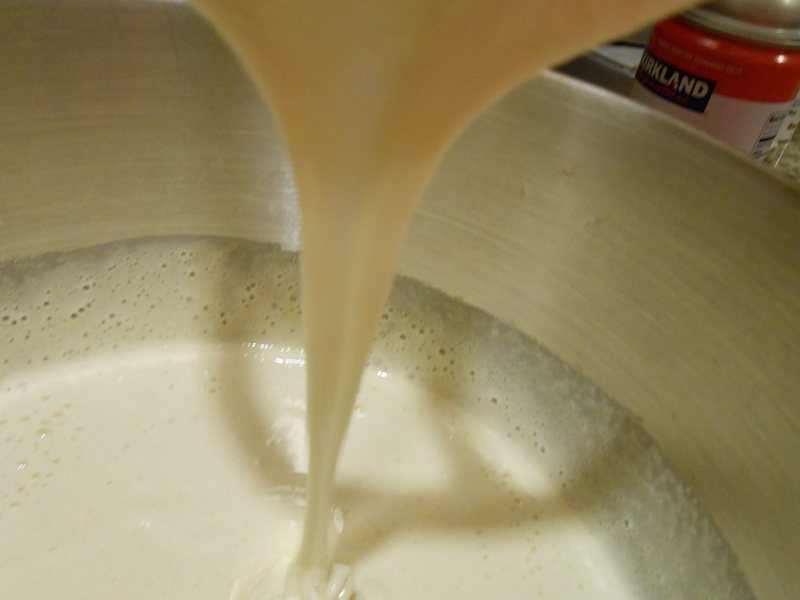 Next, add the vanilla and a pinch of salt; mix; then add the flour and literally fold it in until JUST incorporated. 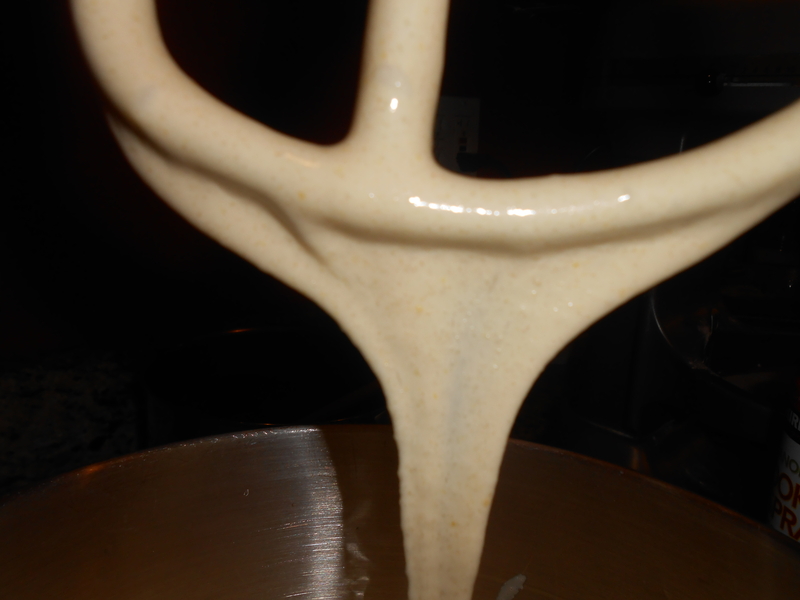 This allows the eggs, which we have allowed the mixer to whip so nicely, provide the fudgey structure. Pour it all into your 9″x13″ pan… make sure you get it all in there…. 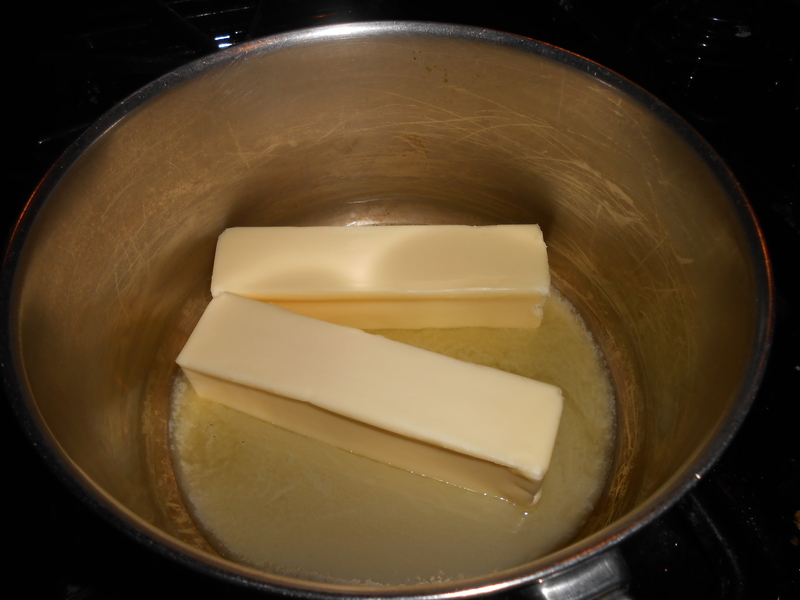 Then QC the batter (assuming you don’t have an issue with raw eggs). 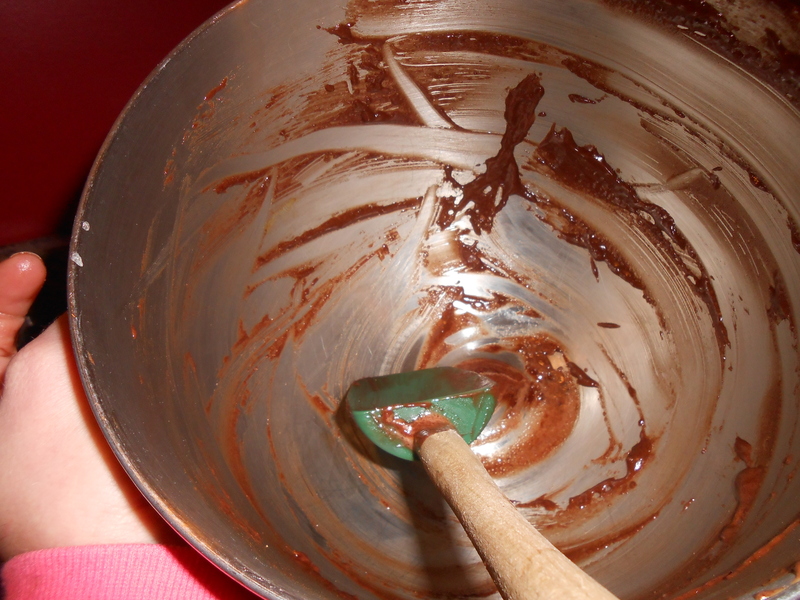 If you are feeling extra nice- you can invite a friend to do extra QC on the remains in the bowl. Get it into a preheated 375 degree oven for 35 – 40 minutes. Mine were done in 35 minutes. You are looking for a crisp top, yet you will have crumbs on a toothpick. 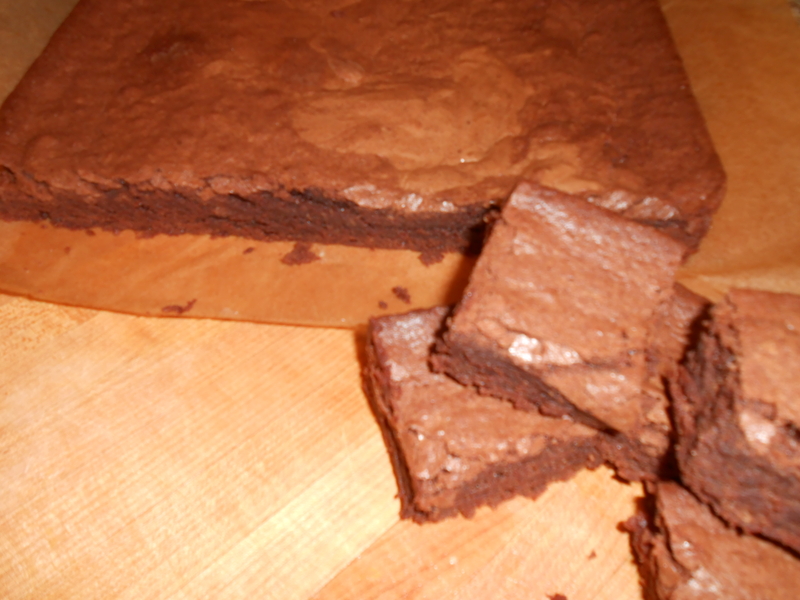 Underbaked brownies are not terrible- overdone is BAD. Done! Right out of the oven. Crisp edges, and a crunchy top layer- with a dense, fudge center. Cross section- see? 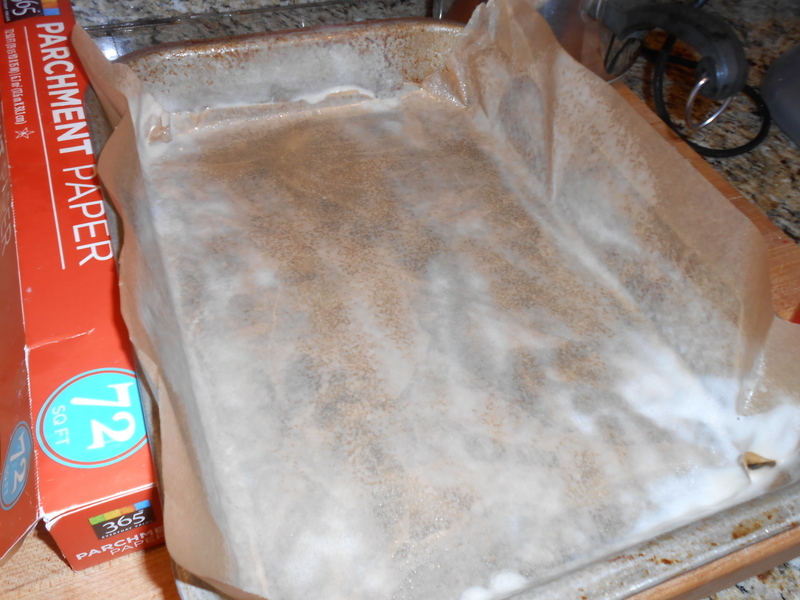 Equipment- 9"x13" pan, prepared with cooking spray and lined in parchment. 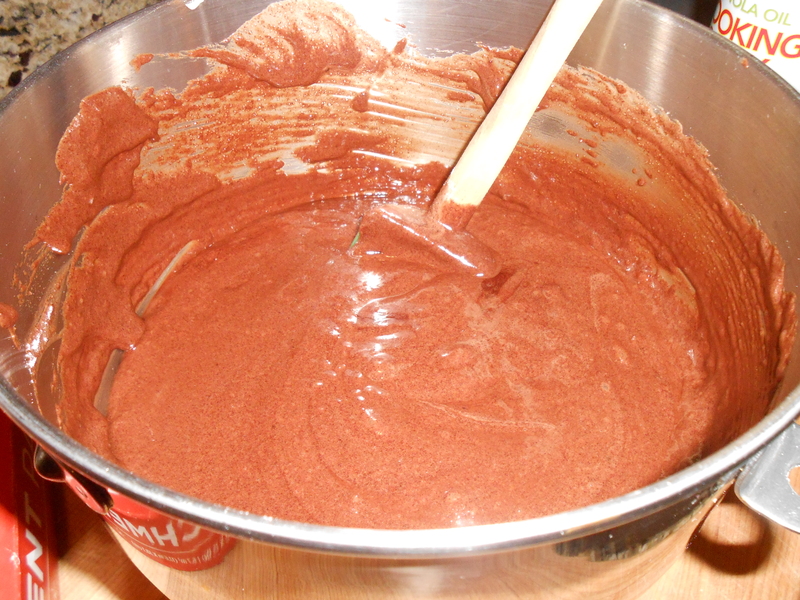 A stand mixer makes this recipe exceptionally easy, but a hand mixer can be used. 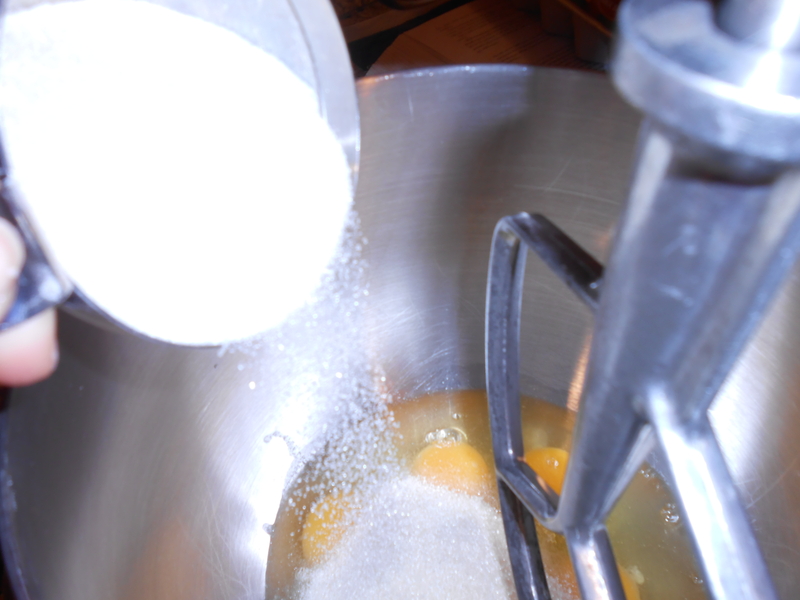 Crack the eggs into the bowl of a stand mixer; add the sugar. Beat at medium high speed for 10 minutes. The eggs/sugar will be thick and creamy, and lightened in color. Meanwhile, melt butter and chocolate in a pan, stirring constantly. The microwave may also be used; take care not to explode the butter or burn the chocolate. Allow the chocolate and butter to cool slightly. 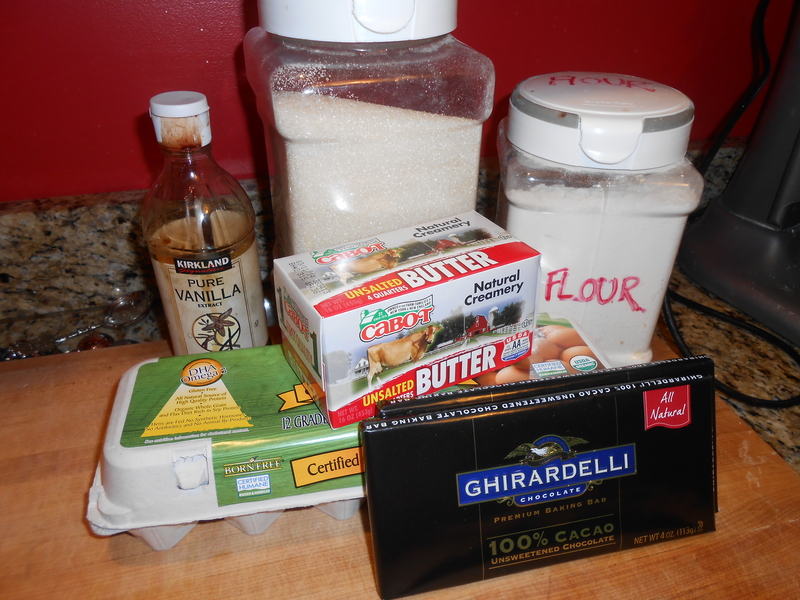 Add the chocolate to the eggs; begin by adding a little bit of chocolate and incorporating it to "temper" the eggs. 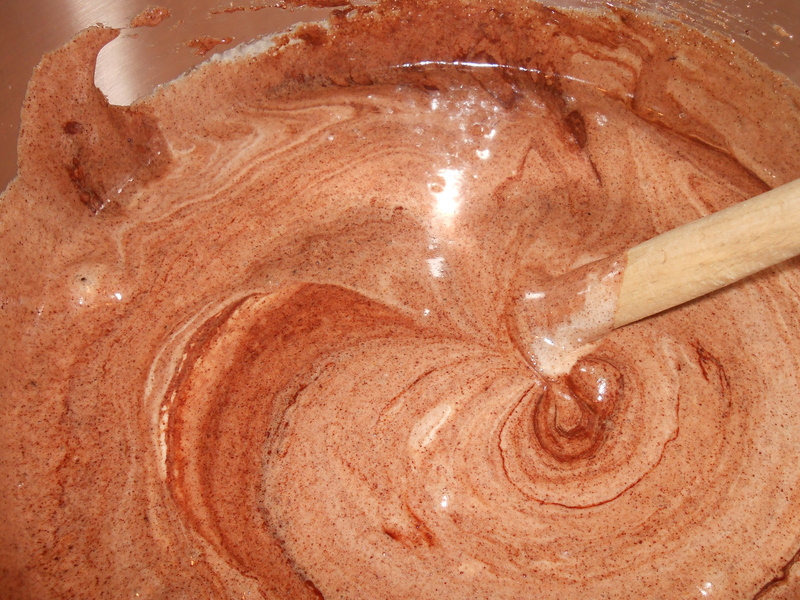 Add the rest of the chocolate, and add the vanilla and a pinch of salt and mix thoroughly. Add the flour and fold until just incorporated. Bake in a 375 degree oven for 35- 40 minutes until the top and edges are crunchy but the brownies still have some fudginess in the center. 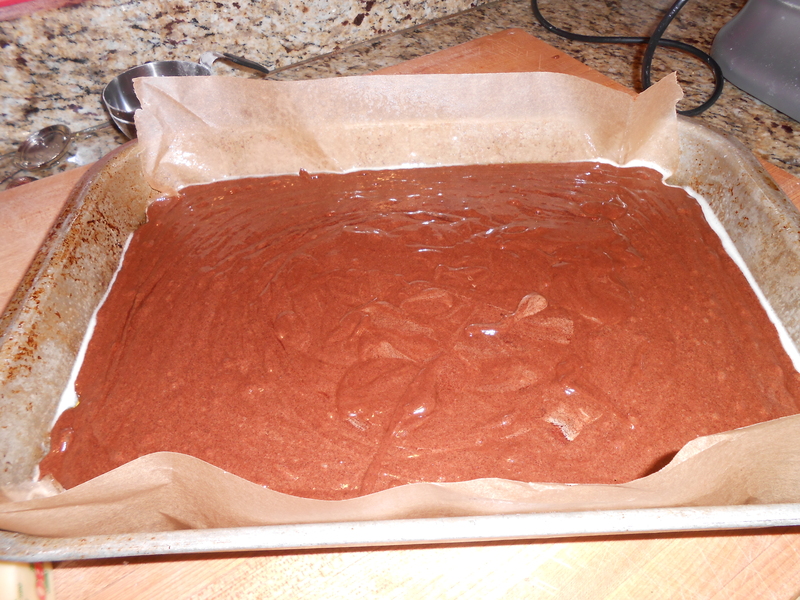 Allow to cool completely in the pan before cutting into squares. 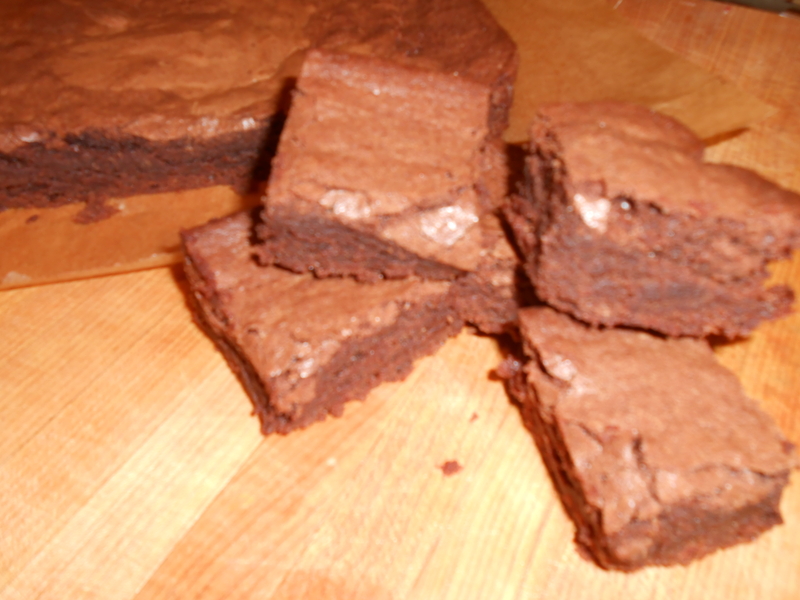 Brownies may be frozen for several months and defrosted on the counter. 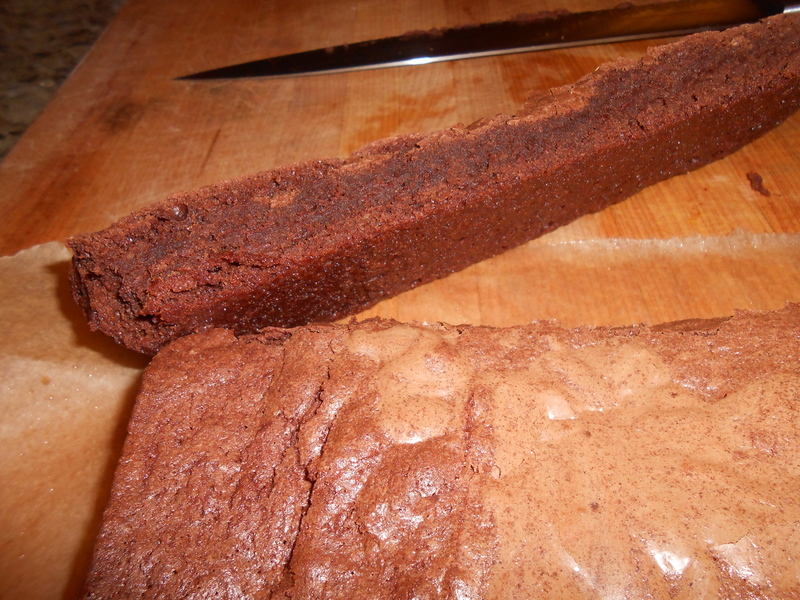 This entry was posted in Cooking, Recipes and tagged bakers chocolate brownies, brownies, fudge, simple brownies. Bookmark the permalink. Another family favorite! And you remembered all the pointers regarding beating the eggs, not scorching the chocolate and not overmixing the flour–crucial for good results. I am going to do your parchment paper trick, it makes perfect sense as these can be a bear to get out of the pan if you skimp on spraying the pan. Love the pictures!